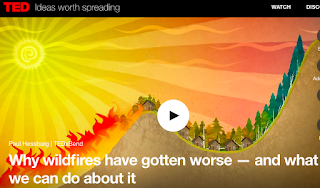 Now that the wildfires in California are in the news once again, this is an incredible talk by the scientist Paul Hessburg that explains the complexity of the problem and what actions we can actually take to mitigate the problem. Personally, I am in favor of prescribed burning and other creative designs to solve this life-threatening issue of our times. Just as we caused the problem, we need to think big and apply design-based solutions. How do you feel about our role in causing these wildfires and how realistic these solutions might be?